The chart below of historical real world GDP shares was featured on CD in November and generated lots of discussion (44 comments) and was also featured on Greg Mankiw’s blog and about 25 other blogs. 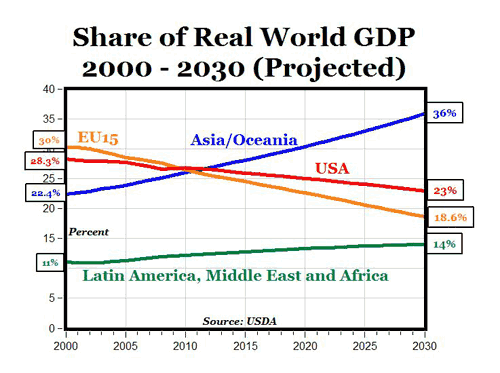 Using the same international macroeconomic database from the USDA, the chart below plots the projected shares of real world GDP shares through 2030, and shows the expected change in the composition of world output over the next 20 years as world output is anticipated to increase by 150% from $39 trillion in 2000 to $98.1 trillion by 2030. As expected, the continued economic growth in China and India will boost that region’s share of world GDP from the current 25% to 36% by 2030. And most likely within the next few years, the Asia region’s share of world GDP will surpass both the USA and EU-15. Also within the next few years, the USA’s share of world GDP will exceed the EU-15’s share for the first time ever, and the USA-EU-15 gap is expected to widen over the next several decades. 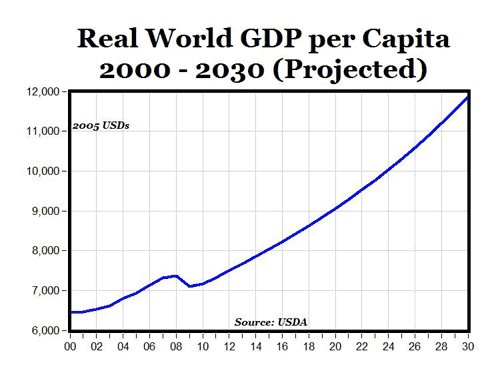 The third chart below shows the projected real world GDP per capita through 2030, which is expected to increase from $6,439 in 2000 (in 2005 dollars) by 84% to $11,875 by 2030. If world GDP increases over the next twenty years as projected, the world economic slowdown in 2009 would be a minor blip on an extended period of economic growth.